Almost all knitting looks better when it has been blocked, but I think shawls are a special case. The difference between a shawl just off the needles and one that has been through a blocking bath is often night and day. After hours of work on a project, it can be discouraging to learn that there’s one more step before your beautiful shawl is truly finished. Blocking is one of those topics that can have new knitters feeling skittish, but it is actually one of the most magical parts of knitting. Stretching out your shawl to reveal its true beauty is a wonderful moment. All lace looks so much better blocked, even simple eyelets. The stitches open up and relax, the yarn fluffs up and “blooms” and the knitted fabric drapes beautifully once it dries. Here’s how to make the magic happen! Step 1: Weave in your ends. Make sure everything is nice and secure! Step 2: Fill a sink or bucket with lukewarm water. Don’t use hot water: it can cause your yarn to felt. You can also add a tiny amount of a very mild shampoo, such as baby shampoo, or a little wool wash. Step 3: Soak your shawl. Gently push your shawl under the water. Don’t agitate the water too much, as the friction can also cause felting. Just gently press until the yarn has absorbed enough water to be fully saturated. Let it soak for 10 to 30 minutes. If you are using more than one colour in your shawl and you are worried about bleeding, stay on the shorter end of the soak time and check on it often. You might also want to add a little white vinegar to the soak. After soaking, you can rinse your shawl by emptying the bucket, refilling it with clean water (hold the shawl out of the way so that the agitation of the tap water doesn’t hit it) and soaking again for a minute. Repeat as needed until the water runs clear. Step 4: The towel roll. Have a large towel laid out flat before you remove your shawl from the soak. Gently squeeze most of the water from your shawl: it’s quite delicate at this moment, so it’s important not to wring it or treat it roughly. Then, lay your shawl flat onto the bath towel, and start to roll the towel and the shawl together like a swiss roll, squeezing gently as you go, then unroll and check how wet the shawl is. You want it quite damp, but not dripping. If it’s still very wet, repeat the towel roll with a dry towel. Step 5: Stretch. Lay your shawl out on your soft flat surface gently. Once you have the general shape, you can start to stretch and pin. If you are using blocking wires, you’ll want to start with a wire threaded through the top and bottom edges. If you are just using pins, start by finding and pinning the center of the top edge. From there, just start gently pulling and pinning as you go. You can slightly influence the shape of the shawl by the way you pin. For a crescent shawl, the ends of the top edge can be curved inwards into a soft “horseshoe” shape: this will make the shawl easier to wear. If your shawl is finished with a picot edge or points, you will want to pin each of the picots or points down individually to make them stand out. Keep adjusting and repinning as you go until you are happy with the shape of the shawl. Leave it to dry thoroughly. Your yarn may react differently to blocking depending on what type of fibre you used. Wool blends benefit from a lot of stretching, so don’t be afraid to be firm. Luxury fabrics, such as alpaca, cashmere, or silk may require a lighter touch. If you’re in doubt, check with your yarn manufacturer. Once the shawl is dry, you can carefully unpin it and try it on. The change to the way the fabric drapes after blogging is quite obvious. 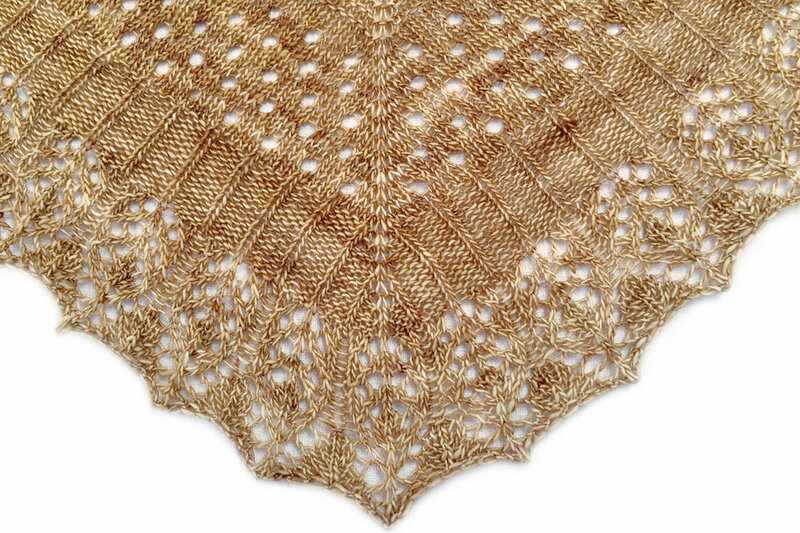 You are likely to have an easier time getting a blocked shawl to lay nicely than the unblocked version. The most wonderful part will be the way the stitches have relaxed and opened up, showing off the gorgeous result of all your hard work.